Anime:Tengen Toppa Gurren-Lagann (Maiking Break-Through Gurren-Lagann). Left: Kamina, Kittanm, Yoko, Simon and Rossiu. Right: Viral, Adiane, Guamo, Citomandra, Timilfo. Kamina Vs. Viral!...QUE GENIAL!..Tengen Toppa -GURREN LAGANN- SI QUE ES DE LAS MEJORES SERIES! 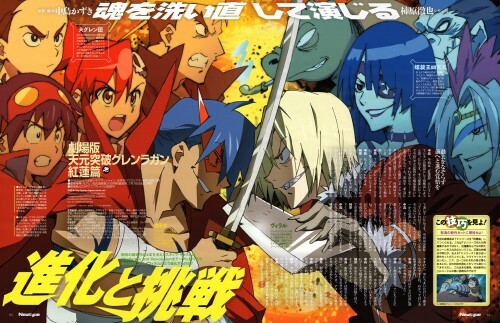 thanks for sharing actually do you guys also think that at the end of the anime Simon really looks like Kamina?